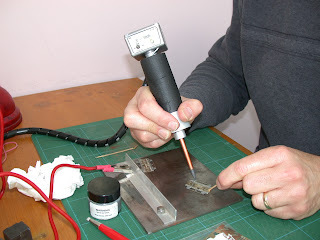 Slightly out of order with the postings on Marks Quay, but I thought I would share my experience of using a resistance soldering iron for the first time. 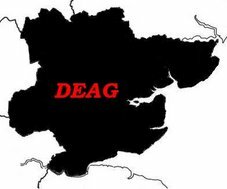 I bought mine via Ebay from Australia and it cost me about £36.00, including postage. Entirely self contained, it is powered by a 12v house alarm battery. It has three power levels and is rated at 150w. At the time of writing one is being advertised on Ebay (10 Nov.'07). 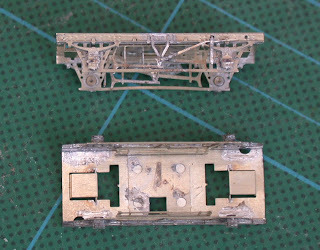 I have two van kits of unknown origin which require underframes so I purchased two 11" cattle wagon chassis kits from the 2mm Association at the recent AGM. Having not used the resistance soldering iron before I decided to give it a go. To ensure a good flow of current, the item being soldered has to be in contact with a conductive plate, mine is steel but aluminium works as well. 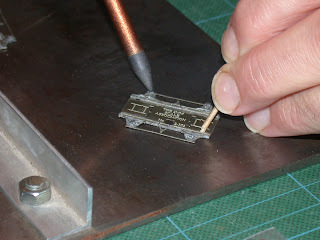 Using solder paste a clean joint has been achieved and it helps that the iron does not have to be removed from the job until the solder has solidified, everthing stays in place. The iron is only hot as long as the button is pressed. The unit has a microprocessor inside which limits the on time to 4 seconds, which is more than enough. It will also switch it off for a sort while if it overheats. I am pleased with the results and can recommend resistance soldering.